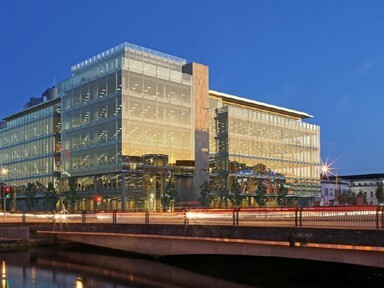 Green REIT Plc the Irish property investment company, confirms that it has entered into a conditional contract for the acquisition of One Albert Quay, a grade A office building under construction in Cork city centre, with pre-lets agreed for over half of the building. One Albert Quay is being developed by JCD Group, led by CEO John Cleary, a local developer with a strong track record in attracting Foreign Direct Investment (‘FDI’) tenancies to the Cork market. • Single office block, under construction, with practical completion and initial payment expected in Q1 2016. • Lettable area of 166,000 square feet (15,400 square meters) over 7 floors, subject to final measurement. • Pre-letting agreements recently signed with 2 tenants totalling 89,000 square feet (8,300 square meters). Tyco, a market leader in the global fire protection and security solutions industries, has agreed to lease 75,000 square feet (7,000 square meters) for its global headquarters, on a 20 year lease with a tenant break in year 12, while PricewaterhouseCoopers have agreed to lease 14,000 square feet (1,300 square meters) on a 15 year lease with no breaks. The total annual rent from these two pre-lettings is €2.1 million per annum. • Estimated total rent per annum from the building of €3.6 to €4.1 million, subject to achieving full occupancy. • Price range of €55 million to €58 million, depending on letting position at the final payment date, with phased payments to be made on lease commencement dates and the final payment 12 months after the initial payment, expected to be in Q1 2017. • Acquisition to be funded through the Company’s revolving credit facility with Barclays Bank Ireland plc Savills acted as agent on the transaction.